Today I am linking up with my teacher friends from I Teach First! Every month we will be linking up to bring you great seasonal, thematic ideas and resources! I had a very nice Thanksgiving with my entourage of boys. Honey Graham’s dad and brother flew in from San Francisco to spend the holiday with us. We had a grand time and I love the memories that are built around the kitchen and the dining room table. Speaking of smiles… I have discovered that I love creating teacher memes using the 2 Equis man. I thought I would share them with you today. I really love making people happy, and I KNOW this is a very stressful time of the year full of commitments, assessments, etc. I hope you enjoy my teacher memes and I also hope that they bring you joy! OMG!!! Please tell me that I am not alone on this one! This is one of the reasons why I use really good skincare. I don’t know why I keep on doing this, especially during three day weekends. I think LOOOOONG and hard before getting the glitter out. I love the sparkly, but I don’t love it in my armpits and between my toes, and my ears, and my teeth. We all know how much we love this! I am sure you can relate to this one! Buahahahahaha! Aren’t they so relatable??!! 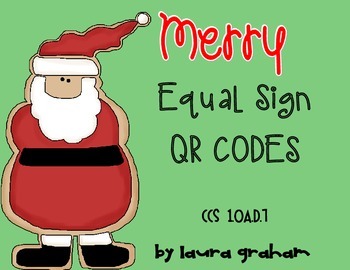 Now for my Christmas freebie… We have been hard at work learning the meaning of the equal sign. This is a perfect math work station to review this important concept while making responsible use of instructional technology!! To get this freebie, click on the picture to download from my TPT store!!! Until next time!! I hope I made you smile, and I hope my freebie makes your life a little easier! !